Aquatint (19 3/8" x 16 3/8"), #51/100, n. d.
Aquatint (19 3/8" x 15 1/2"), #13/100, n. d.
Aquatint (4 1/8" x 3 3/8"), #P/A, n. d.
Mario Romero in Mexico City. January 2010 (Photograph © Anthony Hart Fisher). 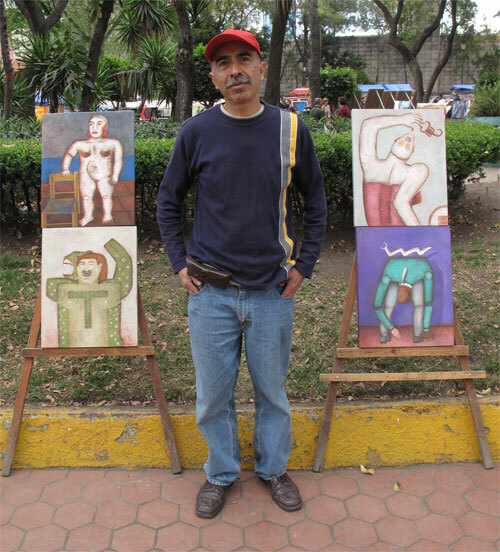 Biography - Mario Romero was born in Mexico City in 1953. He studied at the National University of Mexico (UNAM) and the Taller Nacional de Tapiz del Instituto Nacional de Bellas Artes in Mexico City. Exhibitions - Romero has participated in group exhibitions at the Centro Nacional de las Artes in Mexico City (1994 and 1997); the Feria del Arte in Modena, Italy (1996); the Underground Studio in Grand Rapids, Michigan (1994); the Decima Bienal de San Juan del Grabado Latinoamericano y del Caribe in San Juan, Puerto Rico (1993); the Museo Nacional de la Estampa in Mexico City (1988, 1990, 1991); and the Momentum Gallery in Los Angeles (1989). He has had solo exhibitions at the Polanco Gallery in San Francisco (1995 and 1997) and the Lafontsee Galleries in Grand Rapids, Michigan.